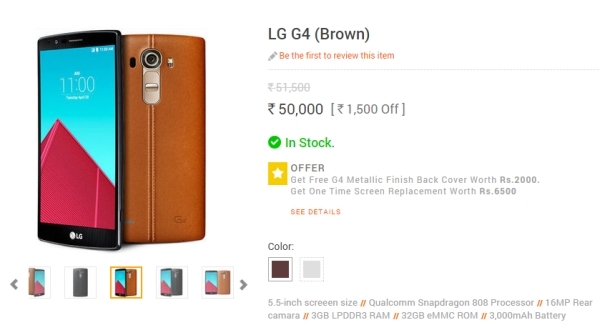 LG is yet to officially launch the G4 in India, but online retailer Infibeam is the first to start selling it before anybody else. The phone is now available for Rs. 50,000 ($780) with an additional Rs. 3000 ($47) off if you use discount coupon "STRIKEOFF3000". Also, you get a metallic finish back cover worth Rs. 2000 ($31) and a one time screen replacement worth Rs. 6,500 ($101) for free. The phone sold in India has the leatherback by default and comes in orange and black only. The LG G4 is the company's latest flagship smartphone. It has a 5.5-inch QHD display, Qualcomm Snapdragon 808 processor, 3GB RAM, 32GB memory with microSD support, 16 megapixel rear camera, 8 megapixel front camera, 3000 mAh replaceable battery, and Android 5.0 Lollipop.